The default font is ‘Tahoma’. The default font size is 8. You can apply as many of these options as you require. For a working example of these options in use see Example: Adding Cell Comments to Worksheets (Advanced). Excel only displays offset cell comments when they are displayed as visible. Excel does not display hidden cells as displaced when you mouse over them. Please note this when using options that adjust the position of the cell comment such as start_cell, start_row, start_col, x_offset and y_offset. Row height and comments. 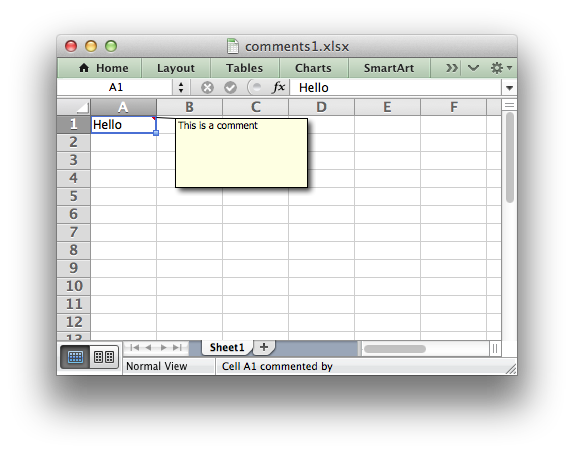 If you specify the height of a row that contains a comment then XlsxWriter will adjust the height of the comment to maintain the default or user specified dimensions. However, the height of a row can also be adjusted automatically by Excel if the text wrap property is set or large fonts are used in the cell. This means that the height of the row is unknown to the module at run time and thus the comment box is stretched with the row. Use the set_row() method to specify the row height explicitly and avoid this problem. See example 8 of Example: Adding Cell Comments to Worksheets (Advanced).